A CROSSFLOW filter specifically designed for low-viscosity water-based protein solutions has low recirculation pump requirements and therefore exerts considerably lower shear stress on protein solutions. 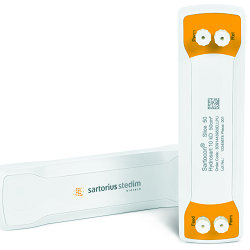 The Sartocon Slice 50 Eco from Sartorius Stedim Biotech (SSB) has reduced flow channel geometry and therefore requires only a pump half as powerful as a standard design. This new crossflow filter has been specially designed for water-based protein solutions with viscosities below 3MPas (3cP). The crossflow cassette can be used in applications such as filtration of IgG, blood factors, and peptides, involving membrane screening and small-volume process development. Like the standard Slice 50 cassette, Sartocon Slice 50 Eco is self-contained and ready to use. It has a filter area of 50cm2. The cGMP-validated unit eliminates the need for a compression holder and is available in a choice of two polymers: a stable polyethersulfone membrane (PESU) that is said to be ideal for a broad pH and temperature range, and a Hydrosart membrane which is a stable, cross-linked regenerated cellulosic polymer. The Hydrosart membrane is said to be suitable for a broad pH range, and can be cleaned and depyrogenated using sodium hydroxide (caustic soda, NaOH) at elevated temperatures. Being extremely hydrophilic, it is non-protein-binding and virtually non-fouling says Sartorius, as well as being easy to clean and delivering exceptionally high product flux and yield.